North Carolina has once again won a full year of federal funding to help the state’s small- to mid-sized businesses increase their export activity – through a program that has already helped North Carolina companies close more than $400 million in international sales over the past six years. The U.S. Small Business Administration (SBA) this week awarded the state $749,225 in 2017-18 grant funding through the State Trade Expansion Program (STEP), which is administered locally by the Economic Development Partnership of North Carolina. STEP, established in 2011, helps eligible companies in states across the U.S. in a variety of ways, including paying for travel costs to major international trade shows that small businesses might not otherwise be able to afford. Alan Davis (left), founder of Asheville, N.C.-based Blue Ridge Chair Works, and company marketing representative Natalie DeRatt used STEP funds to attend the 2017 Outdoor Retailer Summer Market in Salt Lake City, Utah, a leading outdoor gear, apparel, accessories and technology trade show that draws attendees from around the world. 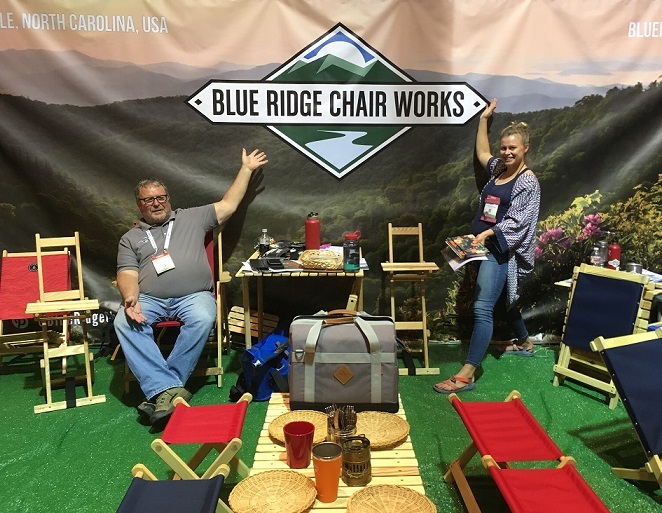 Those companies have included Asheville’s Blue Ridge Chair Works, which produces Appalachian-style outdoor furniture out of its main Franklin, N.C., factory. The company, which employs 15 skilled woodworkers and laborers in Franklin, recently used STEP funds to cover travel and lodging for two employees attending the 2017 Outdoor Retailer Summer Market in Salt Lake City, Utah. From closing floor sales to connecting to a new international distributor, the trip was a solid success. STEP offers businesses up to $3,000 for airfare and lodging expenses related to exhibiting at an international trade show (participation in certain U.S. trade shows with a global audience also qualifies for reimbursement). In addition, the program provides up to $2,000 for the translation of websites or marketing materials to promote products and services in foreign markets. STEP also offers up to $5,000 in reimbursement for a company’s individual booth space at a qualifying trade show (i.e., not shared with other businesses or a distributor). During the current funding cycle ending in September 2018, STEP funds will support three export education workshops for companies in locations across the state. North Carolina, which is one of 44 states awarded STEP grants for 2017-18, has won STEP funding each year since the program started as a pilot initiative in 2011. Since then, STEP has assisted North Carolina businesses more than 900 times. All told, these companies have reported more than $400 million in export sales supported in part by STEP participation. Companies interested in benefiting from STEP should email Jen Vogelsberg, EDPNC’s STEP manager, or call her at (919) 447-7778.